One of the major narratives of the 2018/19 European football season is the mixed results of the continent’s superclubs: Bayern Munich, Barcelona and Real Madrid. After a decade of dominance in the Champions League, none of the three are favourites for the competition, and they have collectively amassed 1.8 points per game domestically, 25% down on their 8-year average. 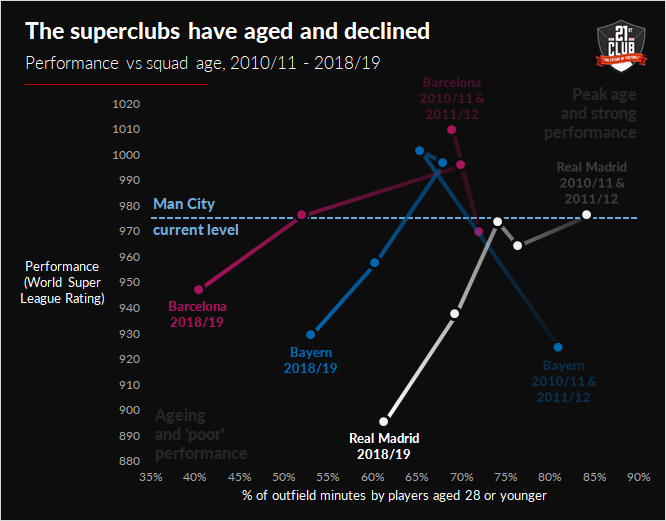 There are many reasons for this decline – which in our World Super League is reflected by Manchester City becoming the world’s best team – but one telling factor is the age of the teams. In the early part of this decade, the three clubs fielded on average 7 or 8 outfielders who were aged 28 or younger – players in the prime of their career or younger (our research suggests outfield players, depending on position, tend to peak between 24 and 28). This season the average has dropped to 4 to 6. Many of the players that lifted these clubs to their heights are still key starters, and while it’s understandable that the clubs want to stay loyal to these players, decline in performance is inevitable with age. Knowing when to move on is a tension that successful teams always face; this ranges from superclubs to lower league sides that have won promotions. Smart clubs spend a significant amount of time on succession planning, so that they know how and when to develop the next incarnation of the team. Understanding how performance varies with age is crucial to this; there’s often a hungrier, younger rival looking to take our spot.